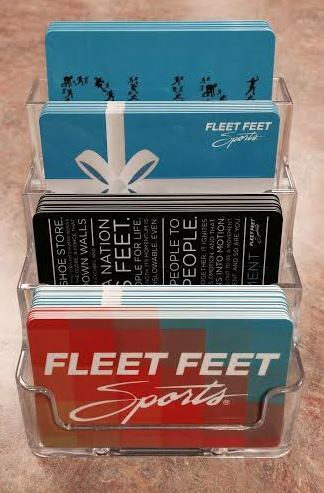 A Fleet Feet Sports Gift Card is a perfect gift for just about everyone: family, friends, coworkers. Personalize your shopping experience with different cards for that special someone. A Gift Card can be purchased in any denomination at Fleet Feet Sports Bloomington and can be used at all participating Fleet Feet Sports stores nationwide. 1. Stop by Fleet Feet Sports Bloomington and purchase one in store. 2. Call the store (309-808-3220) to purchase a card by phone with a credit card. We will mail your gift card to your address - or the destination address - at no additional charge. Note: Please allow 3-5 business days for delivery. 3. Purchase an e-card online here. Note: Additional charges apply. Already have a gift card? Click here to check the balance. The purchase or use of a gift card constitutes acceptance of the terms and conditions. The card has no value until activated by Fleet Feet Sports. This is not a credit/debit card and has no implied warranties. A gift card must be used for the purchase of merchandise or services. A gift card is not redeemable for cash unless required by law. A gift card cannot be replaced if lost or stolen.